If you’re a fan of funfairs then you’ll love this classic 5 reel online casino slots game. This game acts as your typical fairground stall, who doesn't love a good fairground stall? bringing back that nostalgia of being a carefree child once again! So, take your time, take aim and finally shoot the ducks to win huge rewards and maybe some spontaneous free spin bonuses that will have you visiting the fairground on a regular basis. Eyecon truly are pioneers of the online slot gaming industry. Founded in 1997, this Australian gaming company have been going strong for twenty years. Having over one hundred and sixty games available to play, this developer aims to produce unique and enjoyable experiences for all of their players across the globe. Fluffy Favourites, as well as Irish Luck, both remain well-known staples of Eyecon’s portfolio – with over six billion spins every year on their games, this developer is in good stead to continue well into the future. If you want to slots games then their games are surefire winners. Prepare yourselves for a ride down memory lane. Doubleup Ducks puts you right in the middle of a fantastic, colourful, carnival atmosphere. This classic fairground display mimics those days you spent at the fair when you were younger, with jovial music, and an art style to match. This friendly online slot game creates an aesthetic that has the potential to keep you hooked, ultimately meaning that you’ll enjoy every single minute you spend with this adorable little game. Doubleup Ducks retains its friendly atmosphere through the art style that remains consistent throughout all aspects of the game. The bright, cartoony showground stand mimics exactly what you would expect from an online slot game with this theme. 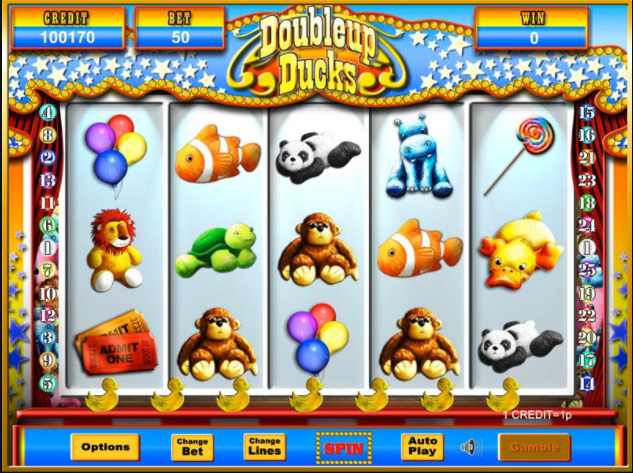 With symbols that also reflect this fairground bonanza – from stuffed monkeys and pandas to lollipops and prize tickets – you will not be able to help but be immersed in this fun-loving slot game. 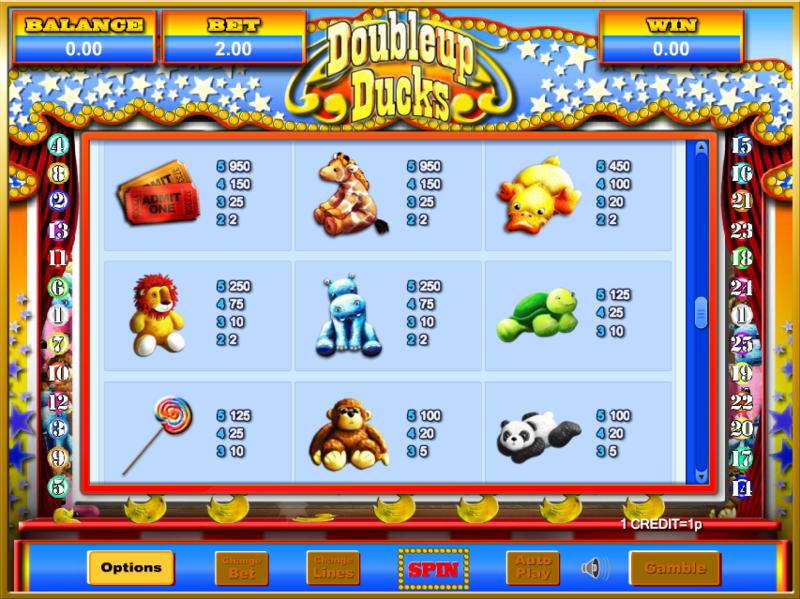 With a typical 4x5 reel system, and twenty-five pay lines to bet on, Doubleup Ducks is accessible, easy to play the game, with various fun and simple symbols to learn. There is the Free Spin bonus slots round, that is achieved when you get three or more of the scatter Duck Shooter symbols on the reels. When this is unlocked, you are given fifteen free spins! As an added bonus for winning this treasured fairground prize, all winnings in this time are multiplied by three. What a great deal! The Wild symbol is special in itself as well. The rare Pink Elephant counts for all other symbols in the game, bar the Duck Shooter scatters. If the Pink Elephant is counted in a win, your prize is doubled! Of course, if you are in the mood to try your luck, after every winning roll you have the choice to activate the Gamble option. If you guess the colour or the suit of the next card that appears in front of you, you can double your winnings! Be warned, however – you are only allowed to do this five times, so use them wisely.